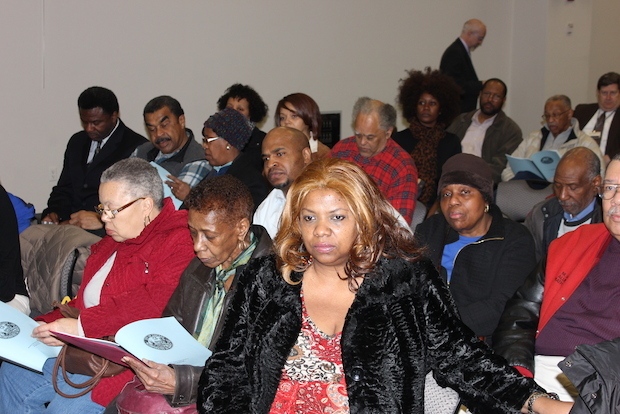 GRAND CROSSING — About 50 South Side residents Thursday gathered at police headquarters and demanded that Chicago Police Supt. Garry McCarthy return Cmdr. Glenn Evans to the Grand Crossing Police District. McCarthy responded by praising Evans' work, but he said he needed Evans to head up the Harrison District, adding, "the decision to send Glenn to the West Side was a difficult decision." McCarthy told the crowd at a Police Review Board meeting, "I have 'fires' on the West Side, and I have to send my best guy." On March 3, Evans was reassigned to the Harrison District, 3151 W. Harrison St., after spending 18 months heading up the Grand Crossing District, 7040 S. Cottage Grove Ave., which covers parts of Greater Grand Crossing, South Shore and Woodlawn. Evans was replaced by James Jones as commander, who previously oversaw the North Side's Foster District, which includes parts of Uptown and Lincoln Square. Police officials said residents in the Grand Crossing District are not being shortchanged with Jones as the new commander. "Commander Evans, who has been in the force for 28 years, had 80 fewer shootings [in 2013] than in 2012, the second largest decline in the city," said Adam Collins, a Police Department spokesman. "Commander Jones, who has been on the force for 27 years, had a 24 percent reduction in overall crime — far and away the largest decrease in the city." McCarthy said the average time a commander spends at a district is two years. Previously clout played a part in commanders getting their position, but "that is not the case anymore," said McCarthy. "Evans replaced other commanders who were not getting the job done," he said. "I know you are upset about Commander Evans being removed, and for that I apologize to you because many of you developed a relationship with [him]," McCarthy said. "But I assure you that the fine work Commander Evans did in the 3rd District will be continued with Commander Jones." Regardless, the Park Manor Neighbors' Community Council said leadership at the Grand Crossing District has been a revolving door, and that's not good for the community. "In the past 10 years the 3rd District has had six commanders. And as long as that continues the community cannot get stable," said Darlene Tribue, president of the community council. Tribue argued Evans needed to stay in Grand Crossing because while he "curbed the violence, he did not stop the violence — all he needed was more time." "He was a down-to-earth cop well on his way to making a difference in the community," Tribue said. Ald. Willie Cochran (20th), whose ward is part of the Grand Crossing police district, agreed. "The 3rd District has suffered from one commander change after another. [Evans'] stay was not long enough to stabilize the community," said Cochran, a retired Chicago police officer. "I worked in the 3rd District as a cop for 10 years, so I know how important it is establish relationships with residents to develop trust." McCarthy said that while the Grand Crossing District is one of its toughest in the city, it was necessary to use Evans' crime-fighting skills elsewhere. "We [often] take commanders from slower districts to more busier districts, and we have a problem on the West Side," added McCarthy. "We need our best and brightest as commanders. Glenn Evans is one of my favorites." Collins said that the change was "a reflection of [Evans' and Jones'] hard work, and their ability to get results for the communities they serve." But residents said Evans was more than just the top police administrator in Grand Crossing. "He was our first attempt to build a better relationship with the police," said Cece Edwards, a Grand Crossing resident. "That's why it would be an injustice not to return Commander Evans." Corey Howard, a Woodlawn resident, pleaded with McCarthy to "bring back Commander Evans to the 3rd District." But McCarthy said his decision was final. "It's a vicious cycle [reassigning commanders], but it is something I have to do," said McCarthy.